When I decided to start a record label last year (records.zippah.com), I was excited by the resurgence in popularity of LP Records. I am of an age that I can remember making major decisions in life (like moving to a new apartment) based on if I wanted to go through the hell of moving my record collection. I still appreciate putting on a record and taking in the big and tactile artwork and liner notes and I’m glad that a younger generation (of mostly hipsters) is realizing what a great experience the LP record can provide. That being said…I’d estimate that more than 50% of the records that I have bought in the past few years sound like complete crap when compared to their digital counterpart. This isn’t a case of one medium sounding better than another (there are plenty of other blogs that will be debating this till the end of time), but rather; a testament to the fact that making vinyl that sounds great in the 21st century is tricky. I am learning this first hand, as our record label is on it’s third round of test pressings with the latest record from the band The Field Effect. It should have been released at the same time as the CD and digital album were, but we just couldn’t get past the dip in sonic quality when comparing it – not only to the digital files, but also to records that came out 20 years ago! So where is the breakdown? Why is it harder to produce vinyl records that sound good now than it was 20 years ago? I have a few observations to consider. First of all most of the records being made these days are being made from digital recordings as opposed to analog tape. This presents a handful of issues including a frequency range that is much wider (especially in the low-end) as well as a more “jagged” (non technical term) treble range. Analog tape has a very smooth quality in the treble range and a well-manicured slope in the bass region. In addition to this, music is being mastered much louder these days. The cutting head on the lathes that are used to cut the lacquer masters simply can’t handle the level or brightness of most mastered digital recordings. Another realization is that years ago there where many skilled lacquer cutters…this has almost become a lost art. The engineers that specialized in this were cutting lacquers all day long, day in and day out. Once vinyl LPs went the way of the dinosaurs, these guys moved on to other – more lucrative jobs and many simply retired. With the vinyl resurgence, it seems that less experienced but enthusiastic younger engineers are learning the craft…the best that they can, as fast as they can. But all of the enthusiasm in the world doesn’t match the experience that those old school cutters had…not yet anyway. I remember when we recorded and mixed exclusively to tape here at Zippah. We would send off the stereo masters, and a couple of weeks later the test pressing would show up. We would give it a critical listen. Now at that time we were primarily listening for skips, and making sure that the transitions between songs were quiet…stuff like that. Nowadays we are listening for “acceptable amounts of distortion” on the center channel (where the lead vocal is! ), and weighing out the cost of remastering and/or recutting verses accepting the current cut. It has been a challenge just to get to this point in the process, and we’re learning more everyday. 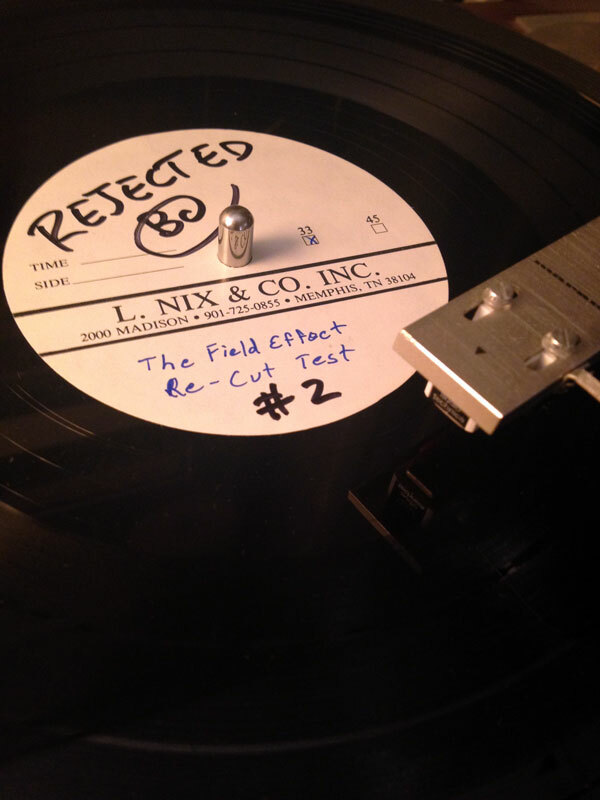 I am happy to say that the last (third) cut of The Field Effect’s record seems to be the charm…and hopefully fans will appreciate the sound quality even though they have no idea how difficult this was to achieve. When it comes to art, nobody really cares how much you suffer…the final result is all that matters…right?